This week on Contemporary Black Canvas we had the pleasure of interviewing physician and poet Irene Mathieu. Irene Mathieu eloquently balances her passionate interests in both the sciences and the humanities. As a child, her parents encouraged the legitimacy and even the fusion of the arts with the sciences and she has truly embodied this ideology in adulthood. Irene is a physician, poet, writer, artist, and photographer, and humanitarian. She received her M.D. from Vanderbilt University School of Medicine in 2015 and is currently a pediatrician in Philadelphia. She is the author of orogeny (Trembling Pillow Press, 2017) and the galaxy of origins (Dancing Girl Press, 2014). 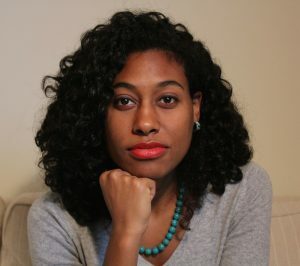 She is the recipient of the 2016 Bob Kaufman Book Prize, as well as a Fulbright scholar and a Callaloo fellow. Her books take a poetic and analytical look at human relationships with the earth and each other, privilege, racism, and love. Her love of language is evident in her interweaving of English, Spanish, and even scientific terms. She use the original word, without translation, in order to maintain the purity of the word in its original language and to prevent the loss of meaning in translation. Ever creative and consistently innovative, she is now working on a collection of poetry focused on the intersection of class and race privilege. Please support Irene Mathieu by visiting her website irene.mathieu.com, following her twitter account, gumbo_amando, or keeping up with her blog motochaskache.com!